Quick hack for elementaryOS time display: use custom format. Currently elementaryOS1 does not allow you to enter custom string for the date format showed at the top of the screen in wingpanel, but fortunately, there’s an easy way to change it. Open up slingshot, type dconf-editor and launch it ( if it’s not installed, you need to install it via apt-get install dconf-editor ). This brings up a configuration editor. 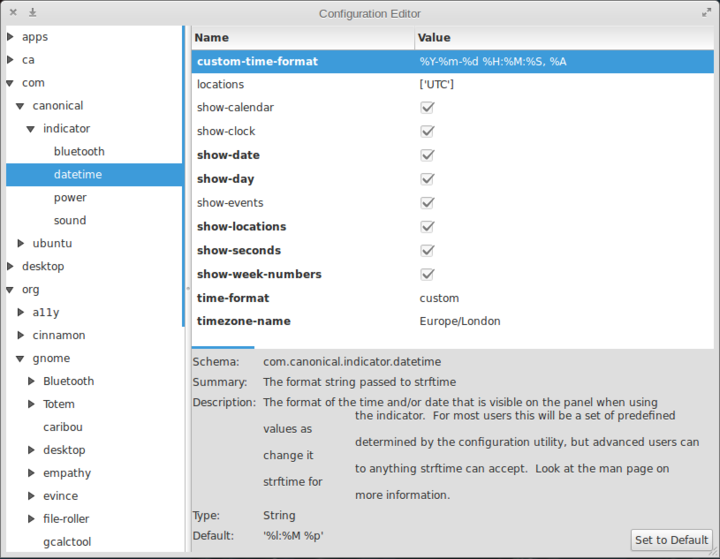 Navigate to com > canonical > indicator > datetime and edit the entry custom-time-format as you like. Change time-format to custom and you’re done; it’s going to change immediately. To see the possibilities, enter man strftime to terminal.